The genus Rosmarinus belongs to the same family of plants as lavender, namely Lamiacae. It consists of three species native to the Mediterranean region. All the garden cultivars available today belong to the officinalis species. The other two, lesser known species, are eriocalyx and tomentosus. The name is derived from the Latin ros meaning ‘dew’ and marinus which means ‘of the sea’, popularly ‘sea dew’ in English. Rosemary is symbolic of fidelity, friendship and love, but is principally associated with remembrance. Probably because it acts as a stimulant – getting the synapses firing! Rosemary has been cultivated in the UK since the late 14th Century. Its main use beyond the garden is in the kitchen as seasoning, particularly with lamb. It’s wonderful burnt on barbecues where the aroma seasons and where the stouter stems can be used as kebab skewers. 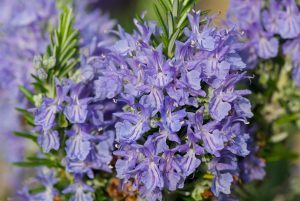 Generally, rosemary has a strongly aromatic, dark green, revolute (turned under at the edges) foliage. Leaves are silky on the upper surface and felty and white beneath. All rosemaries flower from April to June with a weaker flush from September right through the winter. Thus blurring the distinction between autumn flowering and spring flowering! The flowers have a narrow upper lip and broad lower lip. The white throat is typically well defined and dappled or entirely coloured on either side. Most cultivars are hardy to -15C suffering more from wet winters than frost. Indeed the greatest threat to the health of rosemary is waterlogging. This often results in die-back, particularly on older woody plants. Pruning regularly is all the more important. Prune straight after flowering in June to encourage new growth which carries flowers the following season. Take growth back by between a third and a half.